Susan Silton, La Cienega Boulevard north of Rodeo Drive, Los Angeles, February-March 2010. Part of "How Many Billboards? Art in Stead" temporary project organized by the MAK Center for Art and Architecture. "This minimalist composition of thin bands of color, punctuated by repeated uses of bright yellow and blue, provides such an appealing chromatic display that the viewer may not at first see the large text that appears to float both behind and within the striped space....'IF I SAY SO' is an excerpt from a 1961 telegram sent by artist Robert Rauschenberg. Rauschenberg had been invited to participate in an exhibition of portraits of gallerist Iris Clert. His contribution was a telegram that read: 'This is a portrait of Iris Clert if I say so.'" 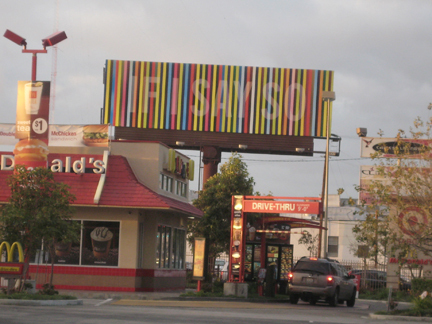 - text from a longer description by Lisa Henry, http://www.howmanybillboards.org/, accessed 03/2010.